Calatayud – a worthy diversion from Zaragoza! I have to admit I had never heard of Calatayud. It was just a point on the map. We were driving from Alicante to Pamplona and, having visited Zaragoza before, we were looking for somewhere different for a night stop on the way. What a great choice this turned out to be! Calatayud is located about two thirds of the way along the A2 between Madrid and Zaragoza. We stayed at the Hotel Marivella on the edge of town which was cheap, cheerful and had a lovely swimming pool. It was a few km to drive back into town but it made for an easy getaway after a night’s sleep. Exploring Calatayud on a summer afternoon was a hot and sticky experience. It was still 39C late in the evening so the shade provided by the high buildings and the tree-lined boulevard was much appreciated. The bull ring was as good a place as any to start and it is quite picturesque with a bronze statue of a bull outside, just in case you hadn’t realised what the building was for. Nearby is the Plaza de Justicia with a stone gate along each edge. Nearby sat a bronze statue of a man playing with his dog. Unfortunately there was no explanation of why! 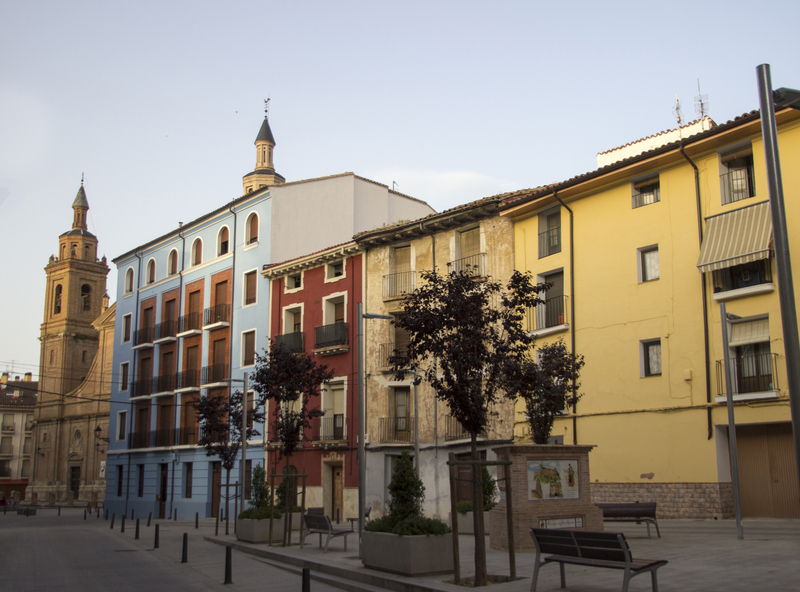 The city is known for its narrow streets and Mudéjar architecture. The bell towers of Santa Maria are great examples of this moorish style. It is easy to get lost wandering through the labyrinth of alleyways but so much fun doing so! You may well emerge at the old city gates which are quite spectacular. Try to find a vantage point of the castle and you’ll be rewarded by spectacular views. If you are lucky the storks will still be around and they add another element to the visual delight of Calatayud. There are so many plazas in the old town too. Many areas are under restoration and hopefully they can bring the city back to its former grandeur. On Plaza España you’ll find a tribute to the old market traders. An old lady stands with her baskets of fruit preserved for time immemorial. Other squares had me reminiscing about time spent in north Africa because they certainly reminded me of that region. When it comes to refreshment, we found River City on the paseo to be really good. Their tapas were superb and had I known that the city was also the heart of a wine region (Calatayud DO) then I would have tried some local wine too. A cool beer was definitely needed after walking around the old town though. I loved Calatayud…it had been on my radar after seeing it from the bus between Barcelona and Madrid, and I went in 2014. It definitely lived up to my expectations. I’m glad you got to experience it! Thanks Pablo. I’d love to go back and try some of the local wine now!